Hillary is channeling Joe Biden. 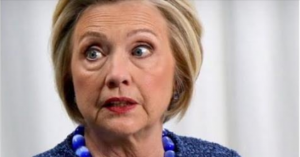 On Friday morning, former Secretary of State Hillary Clinton suggested that President Donald Trump’s Supreme Court nominee, Judge Brett Kavanaugh, would bring back slavery if he is confirmed to the nation’s highest court. “It is a blatant attempt by this administration to shift the balance of the Court for decades and to reverse decades of progress,” the former Democratic presidential nominee declared. The American Civil War started in 1861, after a tense decade of increasing hostility between Southern Democrats who wanted to extend slavery beyond its boundaries as established by constitutional laws and Northern Republicans who saw slavery as evil and wanted to keep it within those limits. Republican Abraham Lincoln campaigned on restraining the evil institution, but an activist Supreme Court ruled that slavery could extend into the territories. Ironically, another Republican president wants to restrain another activist Supreme Court, and Democrat Hillary Clinton is scaremongering. Judge Brett Kavanaugh is an originalist, which means he holds to the original intent of the Constitution and would uphold the laws as written. In the 1850s, that would have meant restraining the spread of slavery — Lincoln’s position. In 2018, it may mean reversing key decisions liberals hail as granting new rights. Never, ever, ever would a Supreme Court justice in 2018 try to bring back slavery. No originalist would ever want to overturn the 13th Amendment, as the Constitution itself now declares (and has since 1865) that slavery — except in the case of servitude for committing a crime — is illegal in the United States.